Retailers across the country are looking at ways of changing residential tariff structures to account for what they see as costs from solar or photovoltaic (PV) systems. It is worth looking in detail at what exactly the costs are. And on the opposite side of the ledger, what value rooftop solar offers. These numbers are based on Perth, the monopoly gentailer, Synergy and the network operator, Western Power (WP), 2017. There are the green certificates, Small Technology Certificates (STC), equal to 1 MWh of green electricity generation. In Perth, the official Clean Energy Regulator rate for each kW of PV is 1.382 MWh of electricity a year. Currently, the scheme allows each system to claim 13 years worth of certificates upfront. So a 3kW system would be eligible for 13 years x 3 kW x 1.382 MWh/kW/year ~ 54 certificates. In the middle of 2017, the market price for STCs had fallen to around $30.00, so just over $1616. Installers of solar systems will then use this money to reduce the cost of the system to the homeowner. This money comes from retailers who have to purchase a certain percentage every year, they then pass this cost onto their customers. Attempting to reduce this to an equivalent per year basis, STCs currently cost Synergy, for this solar system, 3kW x 1.382MWh/kW/year x $30.00/STC ~ $124/year. Actually, it is less than this because all retailers in Australia have to buy STCs (to the equivalent of 9.86% of total sales). There are other retailers in WA but only Synergy can sell to the smaller consumers (<50MWh/year). So Synergy pays the STCs only to it's market share of ALL electricity sales in WA, about 60%, ie the cost of STCs to Synergy of a 3kW PV system is more like $75/year. One of the reasons why retailers are keen to change tariffs, particularly for solar and not, say, those with air conditioners is that part of the retail cost is transmission and distribution, some of which is fixed. As solar systems reduce consumption of electricity while airconditioning increases it, this means solar system owners cost Synergy proportionally more for the network use. Until the middle of 2017, the fixed cost for distribution and transmission was actually greater than the fixed component Synergy charged. 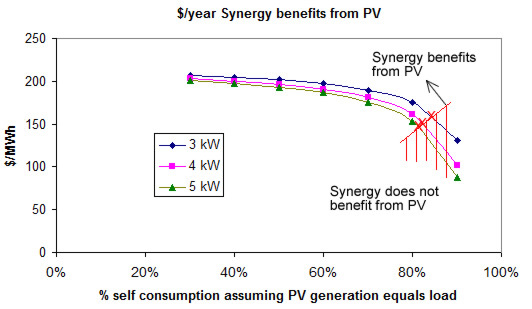 Now, however, Synergy does not lose on any solar installations, regardless of self consumption. According to the Synergy website, the network costs are 45% of the retail unit price, this is a crude guide and tells us nothing about the fixed and variable numbers. This information is available from Table 1 of the 2015/2016 Western Power Price List. For the RT1 tariff, bundled (transmission + distribution) + meter, the fixed component is $296/year while the total variable component is 8.838c/kWh or $88.4/MWh. Note that as Synergy now charges households $347/year for the fixed component, they are up $51/year before the variable costs are included. Ideally, we would have actual data, half hourly from both meters and the solar system inverters from a statistically meaningful sample size, say 30 households, but this information is hard to get hold of. So, assumptions need to be made here on how much electricity is generated and consumed onsite and how much is exported or imported. Anecdotal evidence from installers for a system sized for annual electricity consumption seems have roughly equivalent import, export and self consumption. Total generation a year is actually 3kW x 4.5kWh/kW/day* x 365 = 4.9 MWh/year (equivalent to consumption before PV installation). Half is consumed on site, 2.45 MWh/year, half is exported, 2.45 MWh/year, and as much is imported, again, 2.45 MWh/year. Synergy offers those with rooftop solar, 7.1c/kWh ($71/MWh) under REBS. So the cost to Synergy will be 2.45 MWh x $71/MWh = $175/year for REBS. Under REBS, Synergy pays it's residential customers for excessive electricity from their solar systems, $71/MWh. But what is the value of this electricity now flowing to neighbouring homes that do not have solar? Note that in the Northern Territory, the retailer there reimburses exported electricity at the same price as imported. Interestingly, Synergy does do this for not for profit organisations. However, Synergy will expect to pay the variable WP network charges of 8.838c/kWh out of this 23.37c/kWh, so Synergy nets 14.53c/kWh. Whether Synergy should pay so much for electricity being transfered from one house to the next is another question, entirely. Much of Perth's electricity is generated by coal fired power stations in Collie, 200 km south of Perth and then stepped up to high voltages, 230kV, and transmitted up to Perth before being stepped down. Transmission powerlines, towers, transformers and substations are all part of this 8.838c/kWh bundled rate. *Before the cost of generation is considered. In terms of $/MWh delivered to the household, Synergy actually makes more with the PV system installed, $211 vs $156 per MWh not just because the value of the electricity exported is greater than the cost of the REBS and STC schemes but also because there are less network charges. The cost to Synergy of buying electricity to supply it's customers is not considered here. Given that Synergys' Power Purchase Agreements with its' various generators are all commercial in confidence, there is simply no way of knowing how much generation costs, though an estimate from the Short Term Energy Market (~ 5% of generated) gives an averge of around $50/MWh for 2016. The next biggest cost is in terms of capacity costs; a house with a pool and or electric hot water will tend to have higher electricity bills but may not be running an air conditioner during peak times. Then there is the benefit of solar panels in reducing the requirement for generation capacity during this time. This varies enormously depending on whether the panels are facing west or not and any shading at the time. Dividing the number of GWhs/year (GWh = 1,000 MWh) (18,549 GWh for 2016) by the cost of providing that capacity ($542 million from Reserve Capacity Target (RCT) of 4,446MW x Reserve Capacity Price (RCP) of $121,889/MW for 2016/2017) suggests an average of about $29/MWh. Details from the 2017 Statement of Opportunities and the AEMO website. It can be said that if the household with PV consumed 86% of it's solar production instead of just 50%, Synergy would be earning the same as it would with house without PV ($156/MWh) before. If self consumption is varied to from 30% to 90% as well as the 50%, above, and 4kW and 5kW systems are also considered, we get the following curves. The curves above show how much a year, based on rooftop solar systems that generate according to north facing panels in Perth AND sized to match the annual consumption of those households. The more electricity exported, the more Synergy makes because of the fixed component from Western Power. 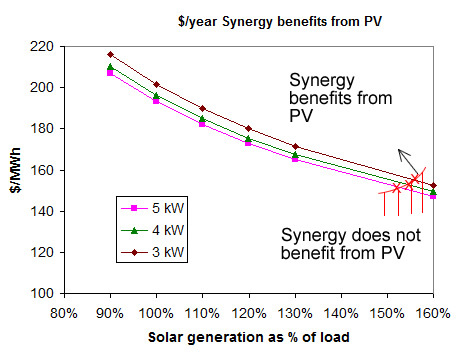 There is a clear line (in red) below which PV does not have a benefit for Synergy. These curves also show how Synergy battery storage enabling much higher levels of self consumption could cost Synergy. Shown below is a graph of varying the load against a fixed PV size. It is assumed that self consumption increases at the same rate as the load increases. If the load is 110% the size of the PV system, it is assumed the self consumption has increased 10%, the import increased 10% but export decreased 10%. The value for Synergy drops with increasing levels of PV generation. The first three are benefits which are enjoyed by the grid operator, Western Power not, it needs to be said, Synergy. One benefit enjoyed by Synergy are the lower wholesale prices during sunny periods (minus a modest increase in Ancillary services). Note that the benefit of lowering of the cost of generation capacity by reducing maximum demand and pushing it into late afternoon/early evening, is actually part of the bundled A1 tariff. Then there are benefits we all enjoy, all the health and environmental benefits of pollution free generation. Whilst difficut to put hard numbers to, these benefits are huge. It means that rooftop solar, at least here in WA, 3kW+ systems actually earn money for Synergy and it's solar systemless customers unless there is little export and import. Synergy is the only Retailer allowed to sell to households but shares the STC obligations with all other retailers in WA. Synergy pays Western Power a variable rate, per kWh, regardless of where that kWh is transported from and to.